We’re finally on the road again! When our biking friends were planning the annual trip to New Liskeard, Ontario, for the Bikers Reunion on the Canada Day weekend at the end of the month, they were quite confused when we told them that we were leaving on June 10th. But it was true. We left home on Monday in the motor home with the Boulevard on the trailer behind. It was pouring rain. Since we hadn’t been able to get away earlier, and we’d already booked ourselves into the Biker’s Reunion, when we read about the Good Sam RV Rally in Syracuse New York, we figured we could combine the two into a three week adventure. We’ve been to a number of Bike Rallies, but never an RV Rally. Since we weren’t booked into the RV camping site until the next night, we stopped near Watertown NY for dinner at the Cracker Barrel (our favourite family restaurant when visiting the US) and spent the night parked in the parking lot, which is OK with them. It continued to rain most of the night and all the next day. The Rally was being held at the New York State Fair Grounds and much of it was pretty muddy. We were given a spot along the inside race track, which wasn’t very attractive, but the ground was solidly packed gravel which meant that, unlike some of the people who’d paid extra for hydro hook up, we didn’t need to worry about getting stuck in the mud. Not all of the buildings and services were open yet, so we had no internet access. When the rain finally stopped late in the afternoon, we took our iPad with us on the bike and found free Wifi at the Mall so we could quickly check emails. When we returned we found the gate that we’d entered through in the afternoon was locked! Fortunately there were many volunteers around and one kind soul led us in his car to where we had to cross over the outside track to the inside. From there we turned in the direction we’d driven in the morning only to find that a large section of the inside track had turned into a slippery patch of mud! Not good on a bike! I think we both held our breath expecting to land in the slop ourselves at any moment, but Jim’s careful and experienced maneuvering got us through. Wednesday was a warm sunny day again and there were a few activities for the early crowd so we familiarized ourselves with the lay of the land, bought our souvenir t-shirts and attended a couple of seminars. One seminar was all about travelling by RV caravan to Alaska, put on by Fantasy RV Tours. That could be one for our Bucket List! We toured some of the new RVs on display and found a new one to put on our Wish List. That night we rode into Syracuse for dinner at the Dinosaur BBQ. The restaurant was crammed with other like-minded souls who thought it a good night to enjoy the nice weather. We were told we’d have an hour wait before getting a seat. There was lots to see among the many posters and artifacts on the walls and ceiling, and interesting people-watching to do. Before we knew it, we had a high top table for two right in front of the bar. 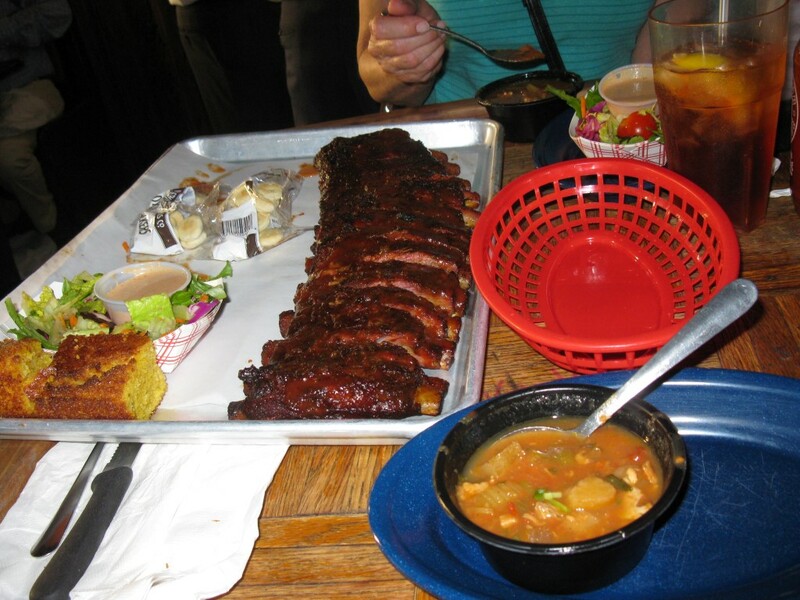 We ordered the rib dinner for two and it was well worth the wait. The price was right too – about what we’d pay for one dinner back home. Thursday the indoor exhibits (i.e. vendors) were open, and since it rained all day again, the building was packed with shoppers. That’s where we spent most of our day and a chunk of money. Today the sun shone on us once more. 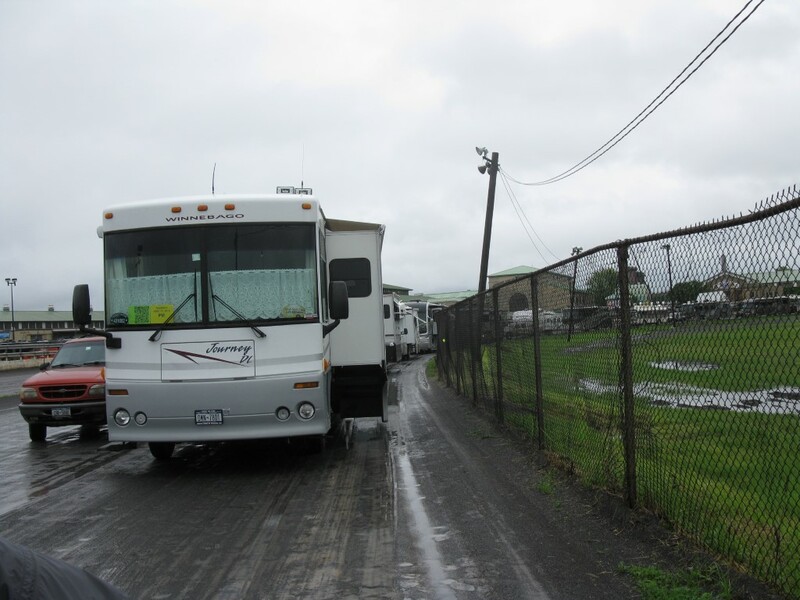 And more RVs had arrived. It was a day of seminars and searching for our “matches”. In our registration package we were each given a numbered sticker that we were to wear everywhere, along with our ID badges. The purpose of the numbers was to search out the three people in the crowds who would have the same numbers. Although some people got creative and wrote the numbers out on large posters, or lists that they attached to their hats, most simply stuck them to the ID badges that hung from a lanyard around their neck. We heard one man comment, “I haven’t looked at anybody’s face in three days!” There are prizes to be had if you can find your match. With Jim’s help, I found one of mine this evening, so I’m now the proud owner of a T-shirt that reads, “I Found My Match” and my name will go into a draw for one of the $5,000 worth of prizes. We still haven’t found Jim’s “match”. Better luck tomorrow. We watched a parade of couples line up to be “Re-hitched” in the park, some in wedding gowns and suits, others in comical attire. The evening ended with a concert in the band shell by none other than Mr. Vegas himself, Wayne Newton. He still puts on an impressive performance, backed by a large band of musicians and two backup singers. Unfortunately, his voice betrays his age. Tonight we finally have internet connection in the RV through a Verizon card, but data is limited so photos are too. This entry was posted in Motorcycling, RV Travel, Travel and tagged bike rally, Good Sam, NY, RV Rally, RVing, Syracuse, travel, Wayne Newton. Bookmark the permalink. ← Bikes, Bikes… and Cars and Lunch!